G rowing up, I was ashamed of being Filipino. In fact, some of my most vivid childhood memories are from when the shame was most stinging. When I was in the second grade, my dad was a chaperone for one of my field trips to the zoo. I was at the age when I constantly wanted my dad around, so I was thrilled as he drove three classmates and me to the zoo. During the drive, I was enjoying the carefree day; my friends and I chattered in the back of my car, giddy about not having to be in school. Then, my dad answered a phone call. The call broke my pleasant mood, not because it delivered any sort of bad news but because when my dad answered his phone, he spoke in Tagalog. I had always been accustomed to my parents speaking Tagalog at home — comforting white noise. Yet I cringed as I watched my non-Filipino friends listen to my dad. Tagalog suddenly sounded harsh and grotesque to me. When one of my friends asked what language my father was speaking, I took her curiosity as scorn. I weakly replied that it was the one of the main languages of the Philippines, where my family was from. My embarrassment for my origins heightened as I grew more concerned with my looks and boys. I recall when I was 10 years old, and the boy I had a crush on came over to my house for a playdate. The day was going well. I was sure that this boy liked me back and that he would want to come to my house — that is, until my great-aunt who lived with my family offered him the Filipino food that was displayed on our dining table. I watched as he politely declined, thinking about he must have flinched at how unappealing the food looked. I was sure he must have found the chicken adobo odd and the mango with bagoong gross. These recollections are only morsels of the humiliation I had felt about being a Filipina in America — part of the blur of old habits and phases when I tried to be a “normal” American girl, much like the non-Asian stars on the Disney Channel and Nickelodeon television shows I voraciously consumed. 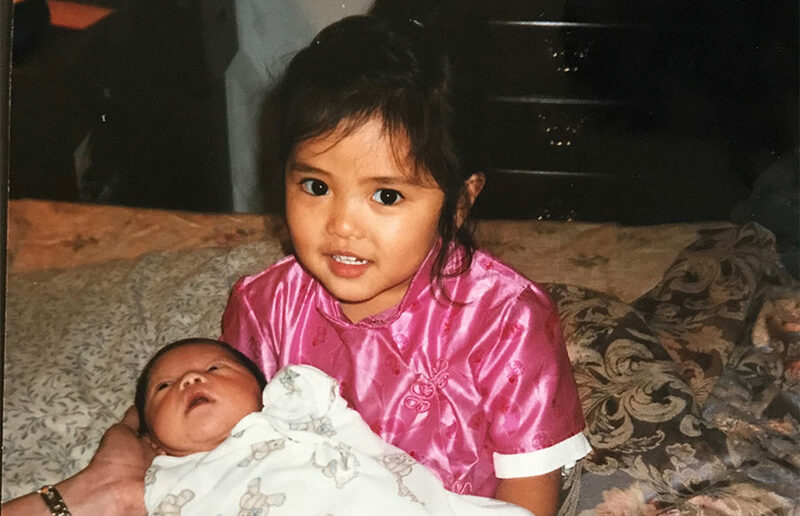 There were the times I thinned my thick, wavy Asian hair, avoided eating Filipino food in front of my friends and daydreamed about having a less exotic name — all parts of my greater effort to erase my origins and to diminish the remnants of my family’s native culture in order to feel truly American. Now, I am ashamed to admit my past shame. But growing up as a first-generation Filipino American, I realized this reality was common among other children of immigrants. Through the anecdotes of people like me, I realized that I wasn’t alone in enduring this tension between my cultural roots and the struggle to feel I belonged in this country, frequently being pulled and prodded into an “all-American” image and away from my Filipino heritage. I can’t say with certainty if the general issues that come with being first-generation American have or haven’t improved at all. I can’t even pinpoint to when my attitude toward my origins began to change. But they eventually did, and because of that, the strain I had often felt as a Filipino American kid has eased, if not completely dissipated. Perhaps it was when I first moved across the country for college. Like countless other students when they leave their family, I experienced an absence of identity. Without my family to validate me, I was lost in the cacophony of college — one that didn’t feel like home to me yet. I turned around, eager to hear Tagalog. At this time when I felt alone, my family’s native language no longer sounded harsh to me, as it did years ago. It sounded like my mom. It sounded like home. We often hear the cliched saying that America is a melting pot. When I was a kid, I never wholeheartedly believed it. Now, I’d like to think this ideal is becoming more of a reality. Along with the irrefutable truth that America is cultivating a more diverse population, a colorful myriad of cultures have found a place in this country. Authentic international cuisines are ever-present: Chinese, Thai, Japanese, Ethiopian, Indian and Mexican foods are ubiquitous and embraced. Immigrants commonly merge their native language with English. Trinkets from other cultures are revered, and to appropriate them is to commit a type of social crime. To be worldly is now the common standard of “cool” among millennials. Here, we are longing to study abroad, to see other nations, to learn, to know and to enrich our lives with other cultures. Undoubtedly we still need to better our ways of embracing other cultures. Cultural appropriation is still a typical social issue. Lack of diversity in our media is prominent. Xenophobia remains prevalent. I find, however, that America is inevitably becoming the world’s hub for fusing cultures together. Despite the current identity crises our country may face, being first-generation American is becoming easier now. Regarding my own cultural origins, I have found that being a first-generation Filipino American and being immersed in a different culture is more than simply a type of cool-factor or some sort of enrichment. For me, it has become this invisible tie that binds me to my family. When I am separated from my family, aspects of Filipino culture are the shared remnants of home. It is the reassurance of who I am. I am terrified that once my grandparents, aunts, uncles and parents are all gone, I will no longer hear Tagalog spoken, and this language will be forgotten in my family; that I will never learn how to cook lumpia, adobo, sinigang and so much more, and these foods that added flavor to my childhood will gradually wane out of my life; or that I will forget the greeting of a kiss on the cheek, the warm hospitality, the love for karaoke, the loud, family parties — features that define my Filipino background and ones that ultimately helped define me. More importantly, I am terrified that I will forget who my family’s history and that once they are gone, I will never gain it back. Because to me, my Filipino culture is an intangible web that ties my family together, even long after we are gone. It is a web I hope to always be a part of — to always keep in my life. Perhaps writing this is a start.